Still learning something new every day! 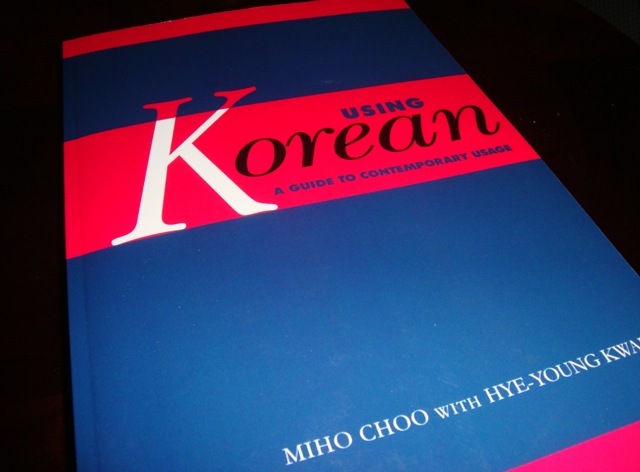 I got a book called “Using Korean: A Guide to Contemporary Usage” as a Christmas present this year, and I’ve finally sat down to properly begin studying it. I will do a proper review once I’m done with it, but for now I’m really happy with it! It’s already taught me quite a few things that I hadn’t learnt in class or on my own. For example, it breaks down how and when to use honorifics and even in what cases you would use a single “시” and in what ones you’d use two. For example, I’d always wondered where to put the 시 in a sentence with a grammar structure like ~ㄹ 수 있다/없다. 하실 수 있어요? or 할 수 있으세요? According to the book, the answer is to put it in both places! So: “하실 수 있으세요?” is correct. Also, it’s taught me that honorific terms like 댁 or 잡수시다, as well as “~시”, are not used in ~는다 endings such as in newspapers or magazines. I’d honestly never noticed that. -_- I don’t know if I’m just not very observant… But I’ve never been told off by a professor for using honorifics in that style, so now I’m kind of confused. I’ll have to look into that before I take the TOPIK in April! Another interesting thing the book taught me was how to indirectly ask a person’s age. Although Koreans always ask other people about their ages (which we can understand considering the language and culture), it can still be insulting to ask someone’s age directly, especially if they are older. So, we know that the honorific term for 나이 (age) is 연세 and the honorific term for 생일 is 생신. But this book says that asking someone “연세가 어떻게 되세요?” is considered too direct and can be offensive (because basically it implies that you’re really old). But you can’t just say 나이가 어떻게 되세요? because that’s also offensive! Ahhhh! 몇 년생이에요? = What year were you born? 몇 학번이세요? = What year did you enter college? 생년월일이 어떻게 되세요? = What is your year, month, and date of birth? (this is just used mostly in forms!). So yeah, I’ve had a lot of “Omg really? !” moments while reading this! I’m excited to read the rest. In other news, I’ve been avoiding trying to do any TOPIK practice tests but I finally did the vocab/grammar and writing parts of the 28th advanced one this afternoon and did pretty well! Enough to pass level 5. So tomorrow I will try doing the listening and reading parts for that one and see how it goes!No more studying for today, I’m super tired… next week school starts again!